This HDCVI Pan Tilt Zoom camera is a 1080P version of our 720P HDCVI 12X PTZ Camera. It is a small PTZ camera that has a true 1080P resolution video output, and is suitable for use outdoors in any type of weather thanks to its IP66 rating. This high definition PTZ camera has a 12X optical zoom lens and 16x digital zoom lens that can be controlled from the DVR, computer, or smartphone when use with our 1080p HD-CVI DVRs. With full optical zoom you can identify a face up to 290ft away during the day. The camera can pan 360° continuously and has a auto-flip feature when it reaches the top or bottom of the field of view to look on the other side. The camera also offers DWDR to help minimize sun glare. It is also very easy to setup PTZ tours when use with our DVRs. We also have a ceiling mount version of this camera available here. The new HDCVI technology allows you to run your cameras up to 1600ft without losing video quality, and simplifies wiring of PTZ cameras. Using one coax cable, the camera can transmit video and RS485 data signals back to the DVR. 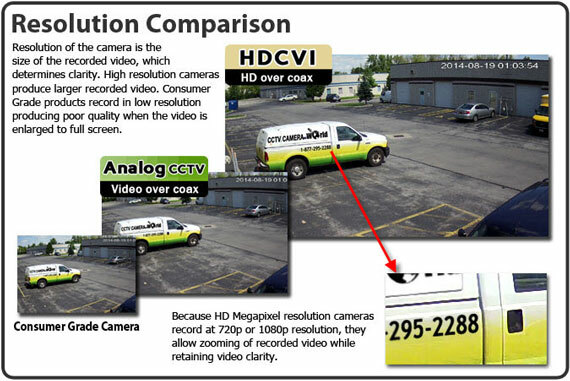 There is also a 3D targeting feature in our HDCVI DVRs and PTZ cameras that makes it easy to zoom in on an area by simply drawing a rectangle with your mouse at the DVR and the camera will zoom in to the location you select. You can even use this 3D targeting method using our friendly PC software when viewing your camera over the internet using a PC computer. Our smartphone and tablet apps also let you control this outdoor HDCVI PTZ from anywhere in the world when connected to a DVR. If you require fast and easy control, consider using our PTZ joystick controller. If you need help, with every purchase you get free technical support for the product purchased. CCTV Camera World also offers free mobile apps and computer software for DVR purchased from us so you can view your cameras over the internet using your smartphone (iPhone, Android, or Windows Phone), tablet (Android or iPad), or PC/Mac computer. Can I use this camera with a 960h dvr? This camera allows the user to set it to either High Definition or Standard Definition video mode using dip switches located inside the camera. If you set it to Standard Definition mode, that is analog video output that can be recognized with a 960H DVR.